with the assistance of Nigel Kerry. 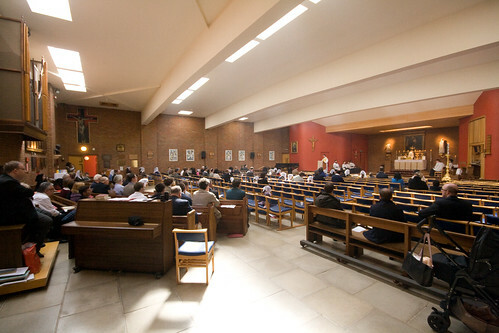 Beginners and advanced groups, sung Mass each day, Sung Compline, Vespers, Benediction and other devotions, courtesy of the St Catherine's Trust Family Retreat taking place alongside the course. Full fee £90 per person. £10 discount for members of the Latin Mass Society. Big discounts for groups coming from affiliated choirs, thanks to sponsorship from the Latin Mass Society. Plus a £10 discount for members of the LMS. I have just recieved this. The Chant Forum was established in 2006, in response to a widely felt need, in order to support and encourage the singing of Gregorian Chant in our monasteries. Previous meetings have been held at Mt. St. Bernard, Stanbrook, Douai and Downside. This year the venue was Pluscarden. Seventeen guests came, representing the monasteries of Ampleforth, Crawley Down, Douai, Ealing, Kristo Buase, Oulton, Petersham, Ramsgate, Rostrevor, New Stanbrook and Worth. In addition we were joined by the directors of three Gregorian Choirs attached to Catholic Cathedrals or parishes. Guests expected from the Abbeys of Glenstal and Roscrea in Ireland had to cancel at the last minute: the Icelandic volcanic ash cloud was disrupting many flights at just this time. The two founders of the Forum, both currently resident in Rome, were unfortunately not able to be with us. Various others, also unable to attend, nevertheless expressed much interest, and financial support was received from the Fernham Trust and an anonymous benefactor, so that we were able to keep all costs to a minimum. The main speaker for our meeting was Mr. Jaan-Eik Tulve, master interpreter of Gregorian Chant, director of prestigious Gregorian Choirs in Estonia and France, formerly a close collaborator with Dom Daniel Saulnier of Solesmes, and widely travelled musical advisor to many monastic communities. This was his second visit to Pluscarden: two years ago he came to help our Choir improve its understanding and interpretation of the Chant, and to direct us in recording some pieces for a Holy Week CD. When Jaan-Eik speaks, and also when he sings, it is immediately apparent that he understands what the Chant is doing, where it is going, what was the intention of its authors, and how we can make that intention our own. With our meeting being held in the fifth week of Easter, he devoted his sessions largely to examination of the Masses of Ascension and Pentecost. He rarely referred to the printed page. So thoroughly does he know this music, in its every detail and nuance, that like its early practitioners he is able to sing it, as it were, simply from the heart. I think all present felt a sense of privilege in this opportunity to sit at his feet, and watch him in action. A single session, just interpreting, for example, an Alleluia verse, would have made the whole meeting worth while. Jaan-Eik’s focus is always first of all on the text: the music is there for the text, and not vice versa. He would often begin any practice by having everyone speak through the text together, paying particular attention to the verbal accents. Of course the Gregorian composer could approach any text in widely differing ways: sometimes an exuberant proclamation, sometimes a deeply interior meditation; now with great energy and movement, now with the utmost serenity and calm. To understand what he is up to musically, we have to let him lead us in responding to the text as he does, and to pray it with him. To convey just some of the lessons Jaan-Eik loved to return to time and again: we should never think of notes in a Gregorian piece as somehow disjunct units. On the contrary, they are always part of a movement, flowing always towards its end. A great part of good interpretation is to “feel” this movement; to see where it is heading; to know which notes are structurally important, and which light passing ornaments. Always the phrase should be sung smoothly, with “a very good legato”. Breathing should be completely natural, relaxed; absolutely without strain or tension. Good breath control should enable us to sing long phrases to the end without any break. Jaan-Eik is much in favour of a Choir director conducting all pieces. If he has the music in his hands, he can lead any group to pass beyond merely singing correct notes, to achieve a living interpretation which will also be well united. Throughout his stay, Jaan-Eik himself directed our Choir at Mass, and it was indeed a joy to experience the beneficial effects of this. Other speakers at our meeting included Fr. Gerard Byrne of the Glasgow Archdiocese. His subject was the current state of the Chant outside the monasteries. He spoke of his own experience, including in Rome, and looked at the many interventions of the Magisterium on the subject, dwelling especially on the phrase of Vatican II “actuosa participatio”. Jennifer Smith, professional singer and singing teacher gave a session of instruction which she called “Chanting on the breath of God”. Our own home team also gave talks: on teaching the Chant to novices, and on St. Benedict’s phrase, referring to the liturgy in Eastertide: “Alleluia without intermission” (Holy Rule 15:1). When the majority of our Forum guests had departed, Jaan-Eik stayed on for some days to give more direct help to our own Choir. One tangible result of this was a reform in the way we interpret sung Psalmody! He also helped us launch another recording project: this time for a CD of Easter Chant. Clearly the meeting was worthwhile and much appreciated by all participants. Plans are therefore already in place for another to be held next year, once again at Douai Abbey.